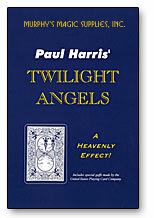 Today, when you order "Twilight Angels by Paul Harris", you'll instantly be emailed a Penguin Magic gift certificate. You can spend it on anything you like at Penguin, just like cash. Just complete your order as normal, and within seconds you'll get an email with your gift certificate. You display a small "angel catcher" (which to the audience looks just like a small mirror) and hand it out to the audience for examination. You then point out the angels printed on the backs of normal Bicycle playing cards and explain that since angels are made of pure light and that the mirror reflects pure light, meaning you can combine the two to alter space and time. You place the mirror on the back of the card so the reflection of both angels is clearly seen. As you slowly slide the mirror across the card, a strange "angel zone" opens up next to the reflected angel. Suddenly, the reflected angel is gone! It's not in the mirror or on the card-the angel has completely vanished! The "angel catcher" is repositioned to display the reflection of the one remaining angel. You slowly slide the mirror to create a second reflected angel. This face optical angel visibly slides off the mirror and onto the card, transforming into a printed angel! You hand the actual printed card with both angels on one end and a blank space at the other! The card, mirror and even the entire deck can all be thoroughly examined. Comes with two specially printed cards on Bicycle stock, mirror, carrying case and detailed, 8-page, fully illustrated booklet. I especially like this effect because there are so many possible ways to perform it. The instructions are almost unnecessary. You probably need to know a sleight or two in order to perform the effect for best results, but even someone who knows only the basic sleights can perform Twilight Angels. The one drawback is that the mirror (ungaffed) provided, is cheap and not especially reflective. So I would recommend getting a better mirror--anything that's about 1" by 2" will work. I also recommend using this effect after another card trick as the nature of the illusion differs from those of other card tricks and makes for a good change of pace. The beautiful thing is that you can have this set up in a deck you are using for another effect and then proceed to perform it almost as an afterthought. Hello, it's the Coming Up again, and this is a review of twilight angels. I got this effect with the true astonishment box. Some other reviewers are negative about this trick. Well, all I can say is that they shouldn't be. It's all about your presentation. I advise, try to use a double back with this. This trick is really great and, for the spectator, comes really close to real magic. If you buy a whole deck of refills, you will be able to give them your just made magical souvenir. This is a true astonishment and if you are a card worker: ad to cart! Paul Harris is known for some really amazing stuff and this is some of it. Overall, it's a pretty cool trick and if done right it will be really deceptive. The trick can be obvious however so you really need to practice if you want to make it look real. If you are looking for some really good Paul Harris stuff, the best is still his Art of Astonishment series, but starting with this is a good choice too. I like but get enough refills for it. Cause if they sign it you got to give them away that's the only downfall. This is such a beautiful trick. The first time I saw the demo it took my breath away simply because I hadn't seen anything like it before- and so you can bet that your audience's haven't either. It's very easy to perform which means you can enjoy the experience of amazing your spectators. This effect, while simple, will kill any woman watching... women react better to this, i don't know why, maybe it's something to do with the angels and the legends but it is excellent! I've had this for about 2 years now and was recharged in using it after I saw that it was included in Paul Harris' True Astonishments Project. I watched a clip of Wayne Houchin performing it and noticed he used the exact handling I've been using for about a year and a half now. I threw away the mirror that was provided when I first got the trick and decided to go with a plain silver Zippo lighter. 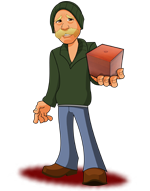 I don't smoke, but I do carry it around quite a bit for weird out of the blue reasons. It just seems more natural to your audience to use a zippo lighter. It makes the whole effect seem even more natural and magical. I recommend using a plain silver zippo for this trick instead of the mirror and check out Wayne houchin performing this effect. It gives you an idea of how cool this effect is. I must admit that when I first ordered the product I was sort of disappointed. But when it came, it was awesome! It is so easy to learn, that the instructional video+directions are almost unnesesary! Also, I showed this to my friend that is a really young one, and he freaked out! He was scraping the card to see if they were stickers, and trying to do it on other cards, etc. This trick is so full of joy to perform, and pays of BIG at the "kicker" finish where both angels end up next to each other. If it allowed me, I would have given it 1,0000000,0000000,000000 stars. Paul Harris rocks! This effect is in a class of its own. It's, in my opinion, as close as you can get to real magic. It requires a 30 second set-up, or you can just have a seperate deck of cards for that one trick. Not only is the card examinable, the whole deck can be also depending on the type of set-up you use. One basic card sleight is required (at least in the version I use). No one I showed this to has ever figured this trick out, and I doubt anyone ever will. It's an awesome trick! You should definetly buy it. Some people may say they know how its done, but everytime I do this trick, The spectators give the WILDEST ways it could be done, but they are all way far off. Trust me, its the best trick. It blows all my friends away. First they think I just made the angel disapear, but when I make it reappear next to the other one, its like Ohmygoshhowdidyoudothat?! Its my all time FAVORITE trick! Buy now!!!! !